Pictures & Images of the prehistoric Nuragic Nuraghe Losa, Abbasanta, Sardinia. 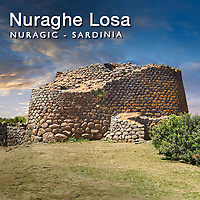 One of the best preserved Nuraghe in Sardinia is Nuraghe Losa. Built of basalt rocks it dates back to the middle bronze age. The central Nuraghe tower at Losa is a trilobed triangular shaped nuraghe built in the Middle Bronze Age (15-14 century BC) surrounded by a walled compound. Outside this area the remains of a Nuraghe village that is surrounded by an outer defensive wall with turrets a defence wall dating from he Late Bronze Age, 13th century BC. The central Nuraghe tower of Losa is about 13 m high today but its original height would have would have been at least 20 m. To this central tower three minor towers are joined to each other by masonry that encases construction. The ogive Tholos roof of the main tower is still in tact. A with all Nuraghe the size of the stones used in the construction of Nuraghe Losa were huge. The incredibly thick walls allowed the nuraghe to reach incredible heights, only surpassed in the Mediterranean by the pyramids at Giza.